Driving: About 36km from Matamata. Walking: Falls are adjacent to picnic/parking area. These are not major falls in either height or volume of flow, but they are accessible. Getting there: From Matamata take SH27 southwards to Tirau. At Tirau turn left onto SH1 to Putaruru. At Putaruru turn right into Arapuni road. The falls and picnic area are on the right at an estimated 6km along this road. We visited them early in April 2010, for two reasons. Firstly they were marked in in our road atlas together with falls at Okoroire on the same page as Wairere Falls. Secondly we were in the area to visit Wairere Falls. 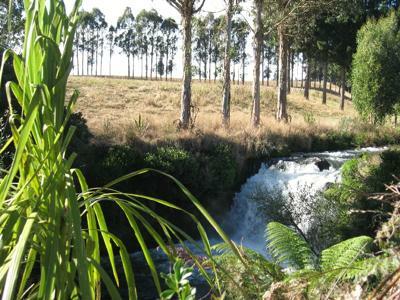 Setting off from Okauia we travelled through Matamata to Okoroire, where at first we could not find Okoroire Falls. We eventually decided that the turbulence, under a tree that had fallen across the shallow gorge, was the falls. Perhaps more of a rapid than a fall. Viewing was from a road bridge, but because of the tree, there were no meaningful photo opportunities. We continued to Pokaiwhenua Falls via Tirau and Putaruru on SH1. Again we did not know what to expect, but the lie of the land did not suggest anything very tall. 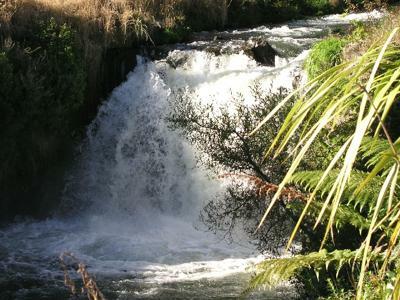 About 6km west of Putaruru we found a picnic area and the falls immediately to the right of the road. The water course is steep sided and there is a safety fence between it and the picnic/parking area.